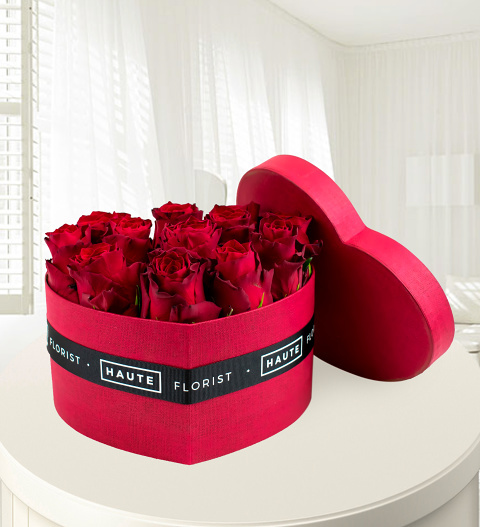 Spoil your special loved one this stunning heart hatbox filled with the most luxurious, classic red roses. When choosing that perfect Valentine's gift, you want one that will leave a lasting impression which is why our expert florists have created this heart hatbox. We've made it easy for you to treat your loved one with this exclusive gift. Included in this arrangement there are 12 Rhodos Roses beautifully presented on this stunning heart box tied with a Haute ribbon bow. Don't forget to add chocolates or a cuddly bear to make this gift even more special. Please note: the heart box measures 10cm (h) x 19.5cm x 14.5cm.